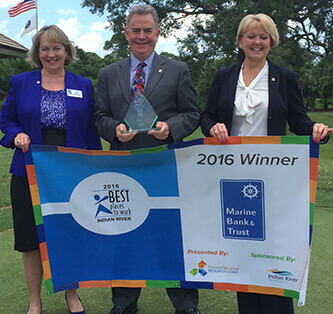 VERO BEACH, FLA. -Marine Bank & Trust was recently recognized as one of Indian River County’s “2016 Best Places to Work” by the CareerSource Research Coast. The annual program surveyed participating Indian River employers and evaluated more than 30 criteria including employee turnover, growth, employee development, internal promotions, benefits, and retirement plans to determine Indian River County's Best Places to Work. This is the Bank’s fourth win after receiving the award in 2010, 2011 and 2013. In addition to recognizing the winners at the June 16th Awards Luncheon and Ceremony at Bent Pine Club, CareerSource Research Coast provided the participating businesses with a detailed benchmarking report documenting the results of the survey and samples of some of the best practices used in Indian River County to attract and retain its workforce. CareerSource partnered with the Sebastian River Area Chamber of Commerce, Indian River Chamber of Commerce, and Treasure Coast Human Resources Association to bring the free program to the business community. CareerSource Research Coast is a private, non-profit corporation with a Board of Directors consisting of private business, educational and economic development representatives, community-based organizations, state agencies, elected officials and a full-time professional staff. Its mission is to promote a bright economic future through the coordination of workforce development activities and services in the four-county area. For the latest information on CareerSource Research Coast, visit http://careersourcerc.com/. Marine Bank is in the process of updating our website and mobile applications in an effort to make them accessible and usable to people with disabilities. Please be aware that our efforts are ongoing as we incorporate the relevant improvements to meet the available accessibility and usability guidelines over time.